Bluff City BBQ Supply, LLC. 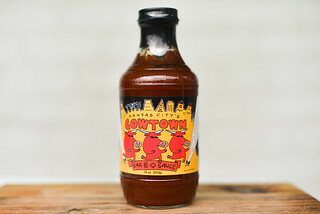 "Hot Sauce" is the right label for this bottle which delivers immense heat and tang at the expense of the other flavors that make up a better balanced sauce. In my move over the summer, I inevitably had to leave some things behind. One of those items was my still half full bottle of Jim Quessenberry's Hot Sauce Beautiful that was provided to me by the folks at Bluff City BBQ Supply, LLC.. 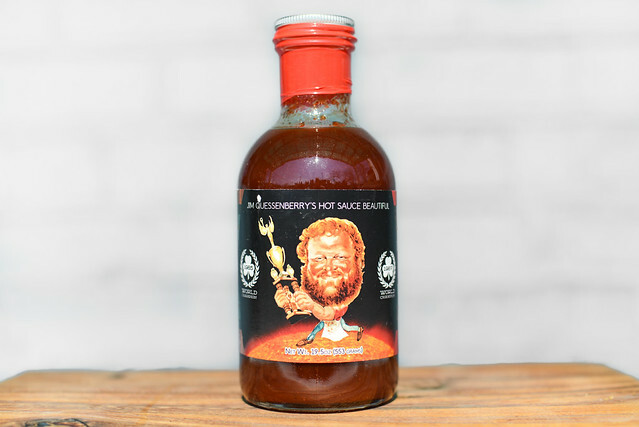 The sauce gets its name from two time Irish Cup International Barbecue Contest champion Jim Quessenberry who first created it in the 1980's. It's currently being produced out of Memphis, TN thanks to Jim's sons, Michael & Lee, along with a couple other friends. 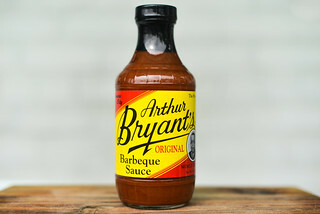 Although I had fully tested and documented the sauce before leaving NY, I neglected to write down the ingredients and reached out to get that list, and in addition to kindly providing that for me, they sent me additional bottles of their original and hot versions, along with their newly introduced white barbecue sauce, which I look forward to trying out soon. Based on the aroma, this is one hot and tart sauce. The smell singes the nose with its strong dose of vinegar and creates a little burn from the prominent peppers, which gives it a character not too dissimilar from a hot sauce. There's a depth to the spices with chilies being the most pronounced, but a bit of garlic and onion mixes in too. There's a very mild fruity component as well from a sweet tomato that lingers in the background. This earthy maroon sauce is semitransparent, which lets you easily see the plethora of spice specs that come in red and black. 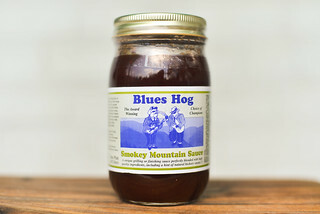 It has a thin constancy a few notches thicker than a Western North Carolina vinegar sauce. This leaves it pouring very quickly and in a steady stream from a suspend spoon. After final quick drips release, a thin coating of sauce is left attached to the silverware that lets you easily see the enormous amount of spices contained within. The initial flavor is incredibly mild in every respect—only a slight tang, sweetness, and fruitiness. Those three flavors do quickly build up though in a nice balance in the seconds after the sauce hits the tongue. Then, very suddenly, the heat makes an entrance and packs one hell of a wallop. 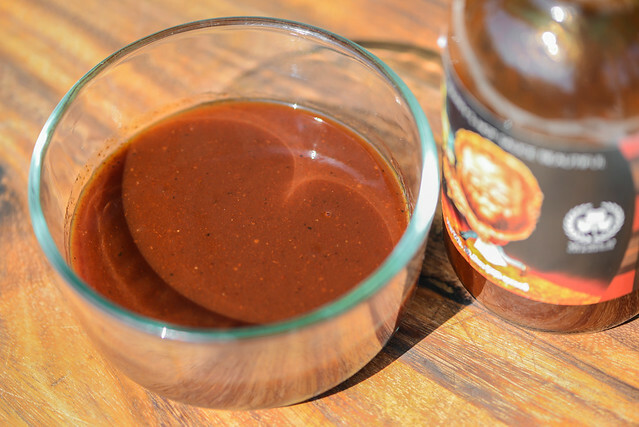 The sauce gets so spicy so quickly that any other nuances are completed lost in the wave of scorching heat that caused a hiccup reaction in me—something only happens with the hottest of the hot sauces. The other trait that persists is vinegar, making the final flavor one of tangy heat that will you leave reached for some sort of relief. 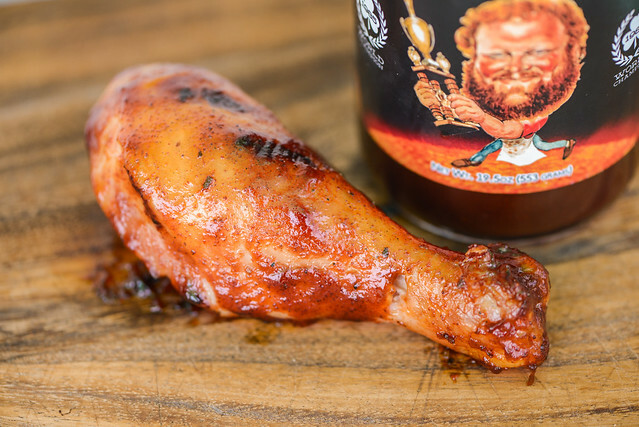 The sauce coated the chicken leg thinly and evenly, baking down well over indirect heat. When moved over the direct fire through, the sauce suffered some burn off, but a thick layer of spices persisted. I gave the chicken one final brushing while still on the grill to make up for some of that lost sauce. I feared the power of the heat would be too much for me to finish the entire piece, but I was pleasantly surprised to find the peppers were more subdued after being cooked. They were still the strongest flavor though and continued to drown out the other good things going on in the background. The heat did build up with each subsequent bite, and by the end of the leg, it was about all I could taste. Longtime readers know I love a spicy barbecue sauce, but Jim Quessenberry's Hot Sauce Beautiful delivers the heat to a fault in my mind. They use a combination of habanero and ghost peppers to get that mouth scorching flavor, but it comes at the expense of all the well balanced sweetness, tang, and fruitiness of the original—elements that are almost completely drowned out here. Out of the jar this made it hard to take one spoonful after the next, and after being cooked, it left the chicken leg a bit too overtaken by heat, lacking the benefits of the additional complexity that makes barbecue sauce so good. While the sauce has a bright and fresh flavor that certainly lets it stand in the high quality category, I'd say unless you're after a whole lot of heat, you'll be better served by their original sauce.